If you like a pretty tank top for summer then this one could be perfect for you. This purple tank top has a racer back and is made from 100% cotton. And on the front of this tank top you can find in a worn look the text “I just want Pretty Things and a pair of Wings” and yes that is what many of want. It’s a fun top that will bring some smiles on peoples faces. You can get this tank top in women’s junior sizes XSmall – 3XL so that many girls can enjoy wearing it. Show the world what you realy want by wearing hit Pretty Things And Wings Tank Top. You of course knew your girls was an angel but this t-shirt proves it. 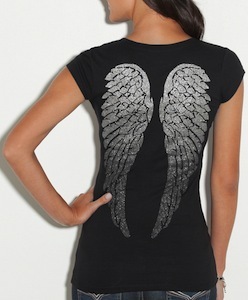 This womens t-shirt has G by Guess logo on the front and some nice big wings on the back. This 100% cotton t-shirt comes in a range of colors all with nice shiny wings on the back. And the t-shirt has a v-neck and is made of 100% cotton. So if you girl is your angel then just select the right size from the big range o sizes and make it clear to hear what you think of her. Come check out this G by GUESS Wings T-Shirt. Quality in the most sylish way, look good and feel good. This is an official Armani Exchange t-shirt that features a very cool winged design on the front and “ARMANI EXCHANGE” printed along the wings in an arc design. Made from pima cotton which is etremely durable and absorbent also very comfortable, a fitted style to hug the body and is available in a wide variety of sizes and colors. 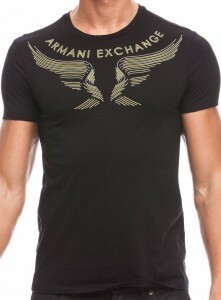 Have a closer look at the Armani Exchange Winged T-Shirt.